r.water.outlet - Creates watershed basins from a drainage direction map. r.water.outlet generates a watershed basin from a drainage direction map and a set of coordinates representing the outlet point of watershed. Input drainage direction map indicates the "aspect" for each cell. Multiplying positive values by 45 will give the direction in degrees that the surface runoff will travel from that cell. The value -1 indicates that the cell is a depression area. Other negative values indicate that surface runoff is leaving the boundaries of the current geographic region. The absolute value of these negative cells indicates the direction of flow. 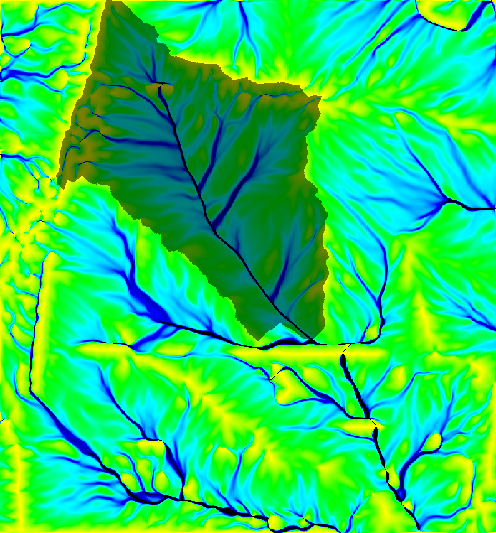 This raster map is generated from r.watershed. Output raster map values of one (1) indicate the watershed basin. Values of zero (0) are not in the watershed basin. In the context of this program, a watershed basin is the region upstream of an outlet point. Thus, if the user chooses an outlet point on a hill slope, the resulting map will be a thin silver of land representing the overland slope uphill of the point.